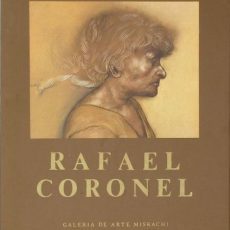 Coronel was born in Zacatecas Mexico in 1932 and became dedicated to painting after earning a grant to study art from the Nacional Institute of Young Mexicans. 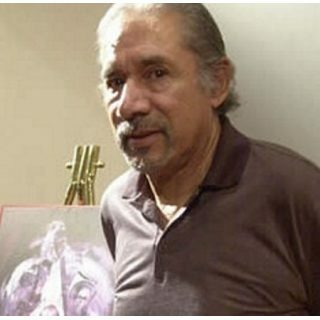 He is considered one of the most important artists of the 1960s movement known as Nueva Presencia, a group of artists who sought to represent the individual in society as a more common everyday man in contrast to muralism’s heroic figures. Coronel’s paintings are inspired by earlier periods of European art history. His technique and style are reference the European Baroque artists of the 17th Century such as Caravaggio and Velazquez and his figures usually are depicted in profile like the portraits of Renaissance art. This influence can be appreciated by the classical manner with which he delineates the figure and applies the use of claroscuro or shading of the figures. His dramatic images are of figures usually placed in solitary dark spaces with the light source directly focused on the portrait, calling attention to their prominence.